Snarling, snotty punk rock with a political bent, Germany's Oxymoron don't pull the punches on their latest, Feed The Breed, a wickedly loud, straightforward attack of punk rock rhythms, screaming guitars, and a pogo beat you'll want to move to. Spicing things up with a bit of melody, the melodic songs help reel you in, as you sing along with the tunes as you jump up and down uncontrollably. 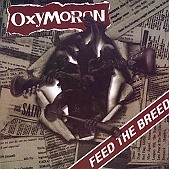 Forget pop-punk, Oxymoron rips that style to shreds, creating a sonic explosion of street punk and turning it into a melodic art form. I'll give this an A-.